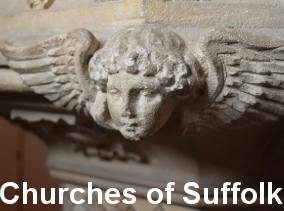 I was out cycling, enjoying the late Autumn sunshine, visiting medieval churches between Stowmarket and Hadleigh. I had come from Little Finborough and Ringshall, and I was on my way to Great Bricett and Bildeston. Everywhere, I was dogged by mediocre Victorianisations, as if this whole area had gone mad on resacramentalising their churches in the 1870s, but hadn't had the imagination or money to do it properly. Another thing that dogged me was helicopters. This was two weeks into the post-9/11 attack on Afghanistan, and I was circumnavigating the vast Wattisham airfield. Here were based the helicopters that would land troops in Afghanistan, so it was not surprising that they should have been out practicing. The high perimeter fence was an incongruous accompaniment to my journey, looming up suddenly beside the narrow back lanes I was threading through. Occasionally, the larger yellow air-sea rescue helicopter would fly low across the fields. The road from Ringshall took me along the perimeter fence for a couple of miles. The weather was starting to brood a bit, and I was glad I'd resisted the temptation to set out in just a t-shirt. I was looking for Great Bricett, and found a narrow lane off to the right which looked as if it might be a short cut. Ahead of me was a cluster of surprisingly urban buildings, given that I was in the middle of rural Suffolk - it was like heading towards the heart of a large town. The heart of the military-industrial complex of the western alliance: All Saints, Wattisham. To be honest, the grim towers of the military industrial complex of the western alliance were less offensive than the utterly banal suburbia of base housing - several thousand people live on the base. But a high wire fence separated me from them, along with several thousand volts, I'll be bound. In an earlier version of this entry, I referred to the base as RAF Wattisham. Technically, this is incorrect. A correspondent tells me that the RAF moved out en masse in 1993 and the base was taken over by the Army Air Corps and is now known as Wattisham Airfield. There is just the one unit of RAF Search and Rescue helicopters there now but they come under the auspices of the army command system. Although this narrow road must once have had an agricultural use, it was now clearly simply an access road to the base. Obviously, in these days of high alert, security must have been tighter than ever. But suddenly ahead of me, in the high perimeter fence, there was an open gate. Even more tantalising, one of the signs pointing into the base at this point said STATION CHURCH. Well, what would you do? There were soldiers in battledress and light blue berets guarding the gate, but they just nodded to me as I cycled past. They'll realise their mistake in a moment, I thought to myself. But no one called me back. I cycled on through the base housing, past a NAAFI store and a community hall. There, ahead of me, stood a yellow brick building with a bell turret beside it. It was All Saints, RAF Wattisham. I stopped outside, and got my camera out. I had just put a new film in, so that when, inevitably, the military police stripped it out of the camera in front of me, I wouldn't lose the pictures from Ringshall or Little Finborough. Looking east: all very simple, and rather traditional. The church is roughly T-shaped, with offices and meeting rooms in the top bar, a simple nave and sanctuary in the other part. I took a couple of shots, and then thought to myself - since I'm going to be arrested anyway, why not try the door? It opened. A nice lady inside was running a playgroup. "Can I take some photographs?" I said. She seemed very surprised, but nodded anyway. "Of course", she replied. So I did. 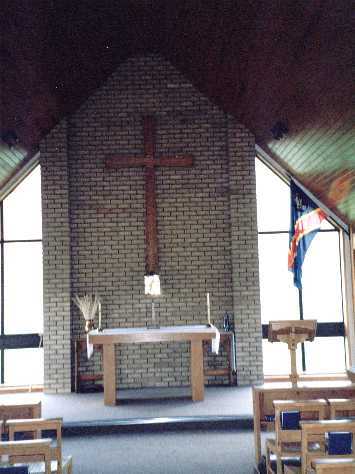 Just what you'd expect - calm carpets, matching pine altar and lectern, exposed brickwork, the whole backlit by wide, clear windows, all very 1980s. It all reminded me rather of Christ Church at Moreton Hall, in Bury St Edmunds. A tabernacle behind the altar suggested that the church might be designed for use by Catholics as well, although despite the modern materials, the layout is very traditional. I imagine that the church has the status of an Anglican chaplaincy, although it is worth pointing out that the medieval Wattisham parish church of St Nicholas is now redundant. In any case, this church is on the far side of the base from Wattisham village, and must actually be in the Anglican parish of Ringshall or Great Bricett, I'm not sure which. I said goodbye, got on my bike, and cycled out of the base - simple as that. At one point a blue-bereted soldier with an alsatian dog stood in front of me on the road - but it turned out that he hadn't seen me, and he apologised as I passed. I headed on to Great Bricett, and then descended the long road down to the King's Head, Bildeston, for a pint and a packet of crisps, a quiet smile of triumph on my face.